Winch - Reach It! - Move It! - Crush It! The Avant hydraulic winch enables towing of all kinds of objects (e.g. logs, poles, boats) from places where you cannot drive with the machine. The winch is equipped with a safety net, 30 m of wire rope and a towing hitch. It is powered by a powerful hydraulic motor and mounts on Avant’s quick attach plate. Use of the winch is simple, one person can easily handle it. The auxiliary hydraulics lever (pedal in 200 series) is switched to continuous flow from the driver’s seat, which releases the wire drum so that the wire can be pulled out by hand. When the wire is attached to the desired object, operator returns to driver’s seat and turns the auxiliary hydraulics lever (pedal in 200 series) into opposite direction and the winch begins to reel in the rope. 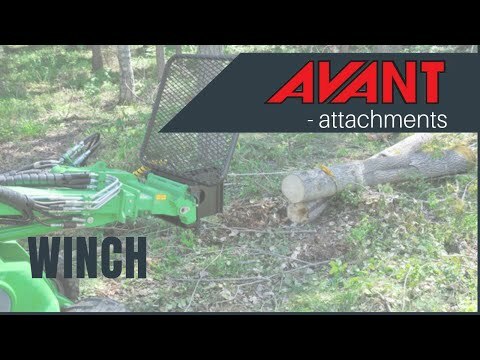 The winch is mounted directly on Avant’s quick attach plate, so you are also able to use the boom for lifting materials with the winch.